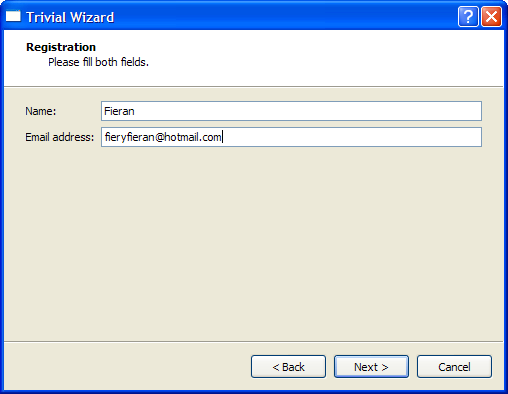 The Trivial Wizard example illustrates how to create a linear three-page registration wizard using three instances of QWizardPage and one instance of QWizard. The introduction page is created with the createIntroPage() function where a QWizardPage is created and its title is set to "Introduction". A QLabel is used to hold the description of page. A QVBoxLayout is used to hold the label. This page is returned when the createIntroPage() function is called. The registration page is created with the createRegistrationPage() function. QLineEdit objects are used to allow the user to input a name and an e-mail address. A QGridLayout is used to hold the QLabel and QLineEdit objects. The conclusion page is created in the createConclusionPage() function. This function's content is similar to createIntroPage(). A QLabel is used to inform the user that the registration process has completed successfully. QLabel *label = new QLabel("You are now successfully registered. Have a "
The main() function instantiates a QWizard object, wizard, and adds all three QWizardPage objects to it. 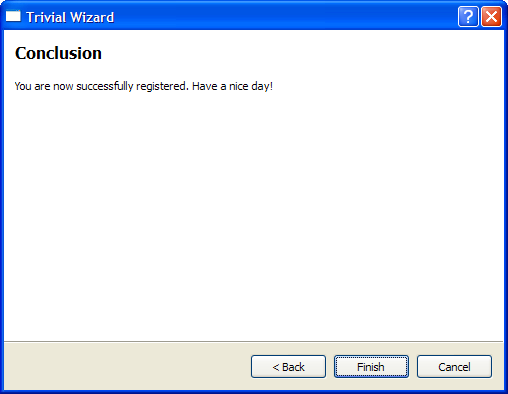 The wizard window title is set to "Trivial Wizard" and its show() function is invoked to display it. 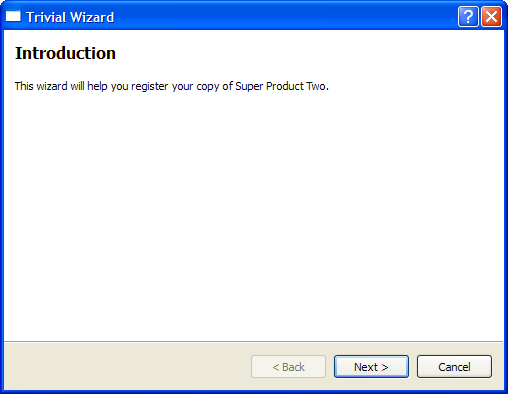 See also QWizard, Class Wizard Example, and License Wizard Example.